Welcome to Prairie Story Recipe Swap Thursday! As we head into the holiday season full throttle, I'm sure you have many recipes that have been in your family for generations. These recipes hold history, tradition, and love and I so enjoy that you may share some of them here! Recipe Swap Thursday's most popular recipe last week was Slow Cooker Salisbury Steak @ Christina's Taste Test Project. Mmmm... be sure to visit her blog and all the other recipes! This week I've posted a new recipe - my Great Grandma Sophie Pitura's Apple Sauce Cake. 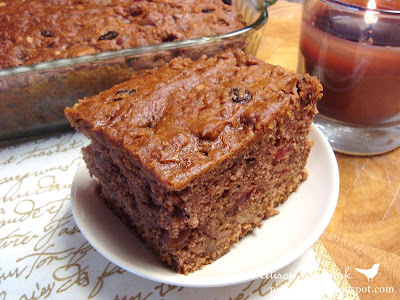 I find this dense, spice cake stays yummy for days and is perfect for coffee breaks. Alison, a spice cake is perfect for this time of year. I always think of spice cakes around the holidays. Thanks for hosting and have a wonderful day! yum! I love dense cakes in the fall. Comfort. The applesauce cake looks wonderful! I love family recipes! Thanks! I love applesauce cake, especially with a cup of good coffee. Thanks for the link-up and the reminder email. THat is a classy applesauce cake. It looks wonderful. A spice cake is the perfect thing now that we Canadians are getting snow! I haven't had applesauce cake in just forever! Looks so good. Thank you so much for sharing your treasured recipe from your beloved great-grandmother ~ those are the best kind and I can't wait to try it! Oh that looks very yummy. :) I just added my link to your swap. 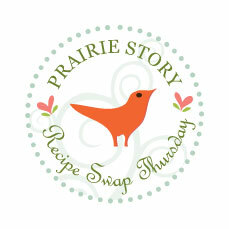 I just started my first swap called Have a Holly Jolly Christmas Recipe Swap Friday. Hope you can come on over, check it out and participate too! :) I would love to have your lovely recipes. I quickly scanned over your blog...I will have to come back and read over it more as I really enjoyed it. I am guessing that you are Ukainian? I am full-blooded Ukrainian...all eight of my great-grandparents came here to ND from Ukraine. :) Hope you can stop by and say hi!! !